I love stamping and creating cards. I'm hoping to share ideas with other stampers. Well, I'm still up and I made another card! I love eagles, so I was very excited when I found this image from Sweet'N Sassy. I used all SU scrap cardstock! I cut and added the red stripes to a square of white cardstock. I embossed the blue with a perfect polka dots folder from SU. The ribbon and the bling is from my stash of treasures. Thank you so very much for looking! Oh, another card! Love your ribbon, it looks great along with the papers. Thanks for playing with us at Scrapalicious this week. Please consider turning off word-verification - thanks. this is so nice with all the bling. Thank you so much for participating in our Allsorts challenge this week and good luck! This card is perfect for this holiday weekend! I love how you hand-cut the eagle! How majestic! Thanks for joining us at SNSDC! I love the eagle!! Great card! Thank you for joining the challenge at Scrapalicious USA! Best of Luck! Beautiful card. The flourish is fabulous. Thanks for joining in the LCI Challenge this week. Fabulous!! Love the "flag" and the bling you added! A fabulous card, gorgeous pearls. Thanks for joining us at CES Challenges & good luck. Beautiful card! Love the swirls of gems. Great job coloring the eagle. Fantastic! thanks for playing along with us at SNSDC! AWESOME card! Love the bling. Thanks for sharing with us at Craft us Crazy! Thanks for playing with us @ Craft Us Crazy! This is a very nice card. Thank you for joining us at the CMM. 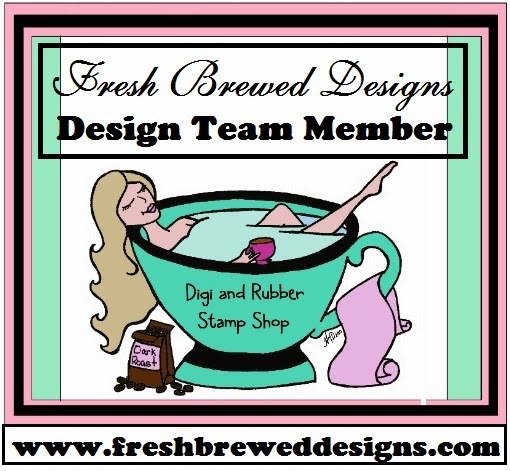 Proud to be on the Freshly Brewed Design Team!